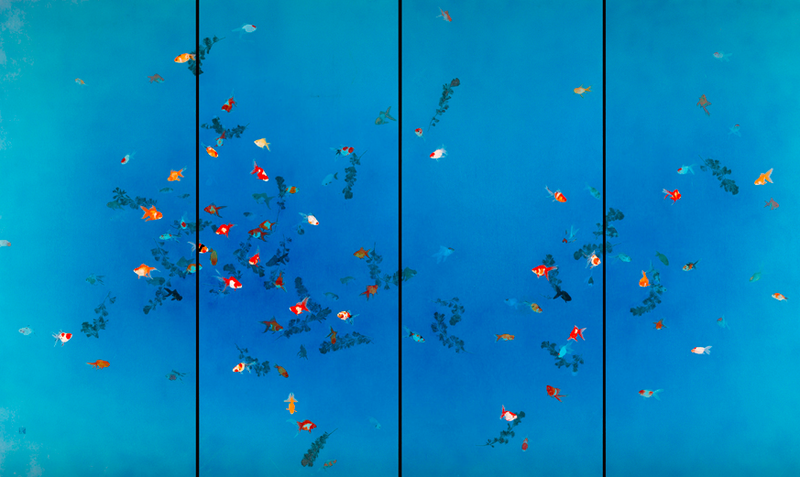 Hope 2 希望２, mineral pigments 150 x 200 cm, Private Collection. In the distance, the morning sun peaks over the mountains of Chôkai鳥海山, casting a warm blanket of sunlight across the horizon. The mountains, whose name suggests the resemblance of a bird in the sea, weave in and out of the painting like restless tides. Much of the landscape is rather sombre- enveloped in an elegy of grey and drowned in muted shadows. Some respite however, is found in the stirring of life in the light and what the snow-dusted peaks have come to reveal . The sun, an ever-reassuring presence, rises above and illuminates the heaving ridges. Mountains have always been close to the heart of Japanese culture. Revered as sacred sites where Gods were said to dwell, they offer sanctuary to meditating priests and welcome thousands on arduous pilgrimages. 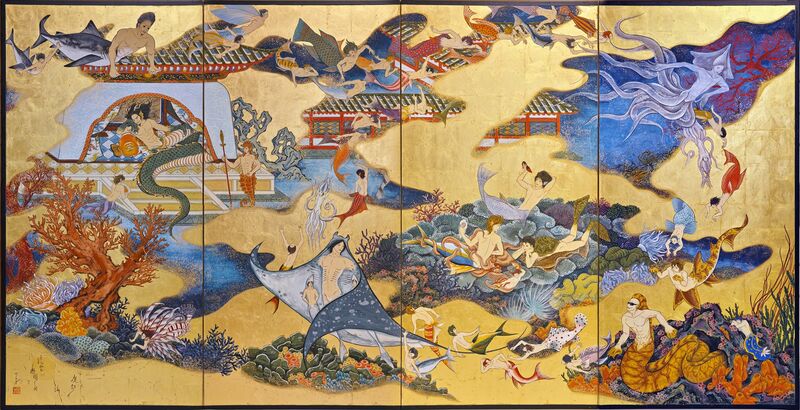 As one of the most enduring symbols of Japanese culture, they have been admired, written about and painted. From the poems of hyakunin isshu (one poem each by one hundred poets) to Hokusai’s prints and the paintings of Yokoyama Taikan, mountains have soothed and inspired many. 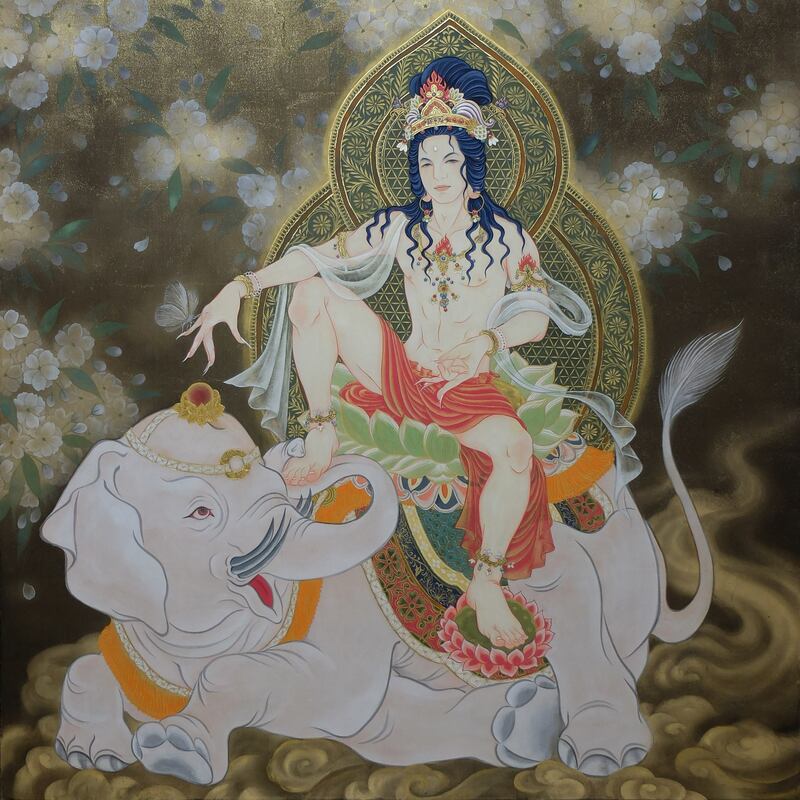 These are the feelings that stir when we encounter Hope, by Nihonga artist Yuriko Kitano. In the aftermath of the Tohoku Earthquake, Kitano looked for ways in which she could help those who had lost their families and homes. 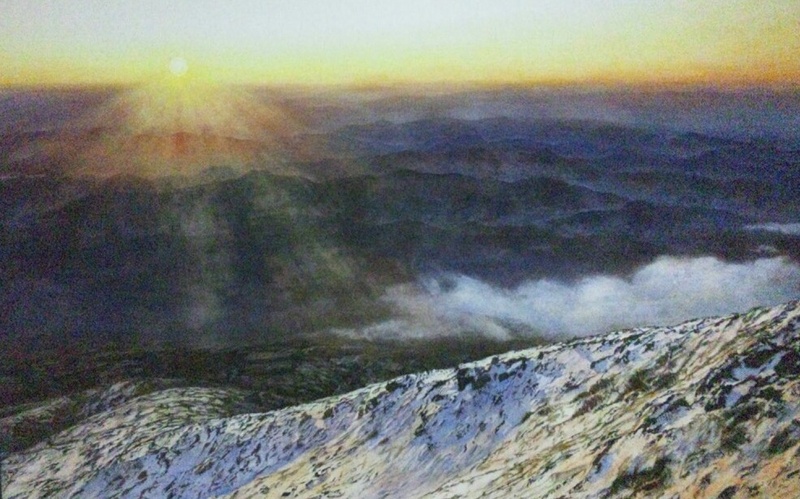 In her search, she found the answer in her paintings and in the magnificent beauty of Chôkai (mountains that borders Akita and Yamagata in the Tohoku region). Just like Nihonga masters before her time, they too, used art to encourage and inspire. During Japan’s participation in the war in Asia and the Pacific, Yokoyama Taikan’s images of Mount Fuji and the symbolic rising sun served as encouragement for the conscripted. Post-war Japan found hope in Higashiyama Kaii’s country Path道 that veered into the unknown. Decades later, a young Nihonga artist working in Yamagata offers the same precious hopes and inspiration in her art. In Hope, there is immense comfort in knowing that the sun will always rise and the advent of each new day continues to bring hope and symbolic new beginnings. Kitano hopes that her work will encourage and inspire those who continue to face adversity and loss arising from the Great East Japan Earthquake of March 2011. Many of Kitano’s large-scale landscape paintings are inspired by the abundant nature of Yamagata. The artist’s respect for nature and admiration for harmony in natural environments has been a consistent theme in her work. Kitano’s works are opportunities for quiet contemplation — from pounding waterfalls to swirling river currents, and magnificent mountainous ridges. Each scene, an impermanent beautiful state is delicately captured and brought to life in her paintings. The piercing sunlight right at this juncture in the sky balanced by stirring mist awakened from its slumber is an impermanent moment never to be seen again in the same way. From a culture that places much joy and appreciation in the impermanence, Kitano understands this well and successfully captures beautiful impermanence for our enjoyment. Yuriko Kitano graduated from Tohoku University of Art and Design with a major in Japanese painting　in 2012. Having held a solo exhibition earlier this year, Kitano hopes to continue her practice as a Nihonga artist and realise her childhood dream of exhibiting at the Inten *oneday. *The Inten is an annual art exhibition organised by the Japan Art Institute. It is a prestigious art exhibition showcasing the country’s finest Nihonga artists. Postnote: Just received news that Yuriko has been selected for the Inten! Congratulations!! 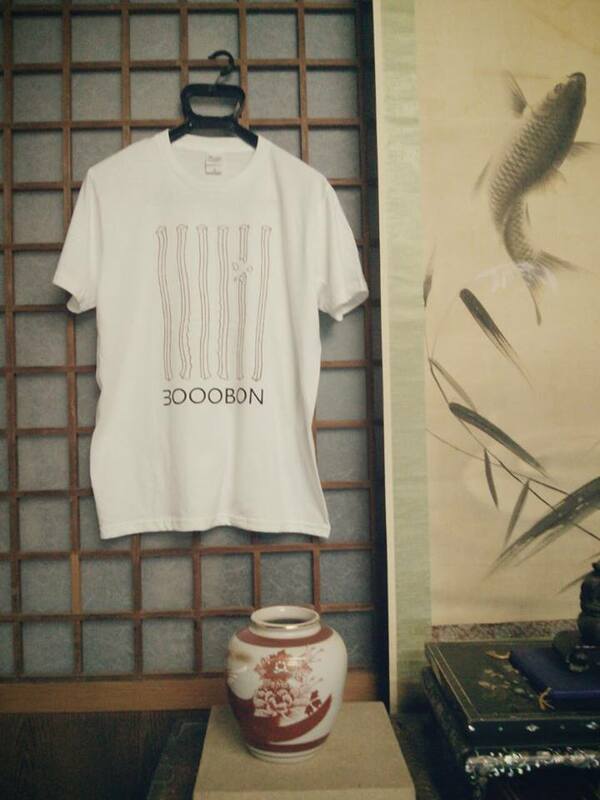 We have a little giveaway for our readers and fans of Nihonga. Please leave a message here with your name. 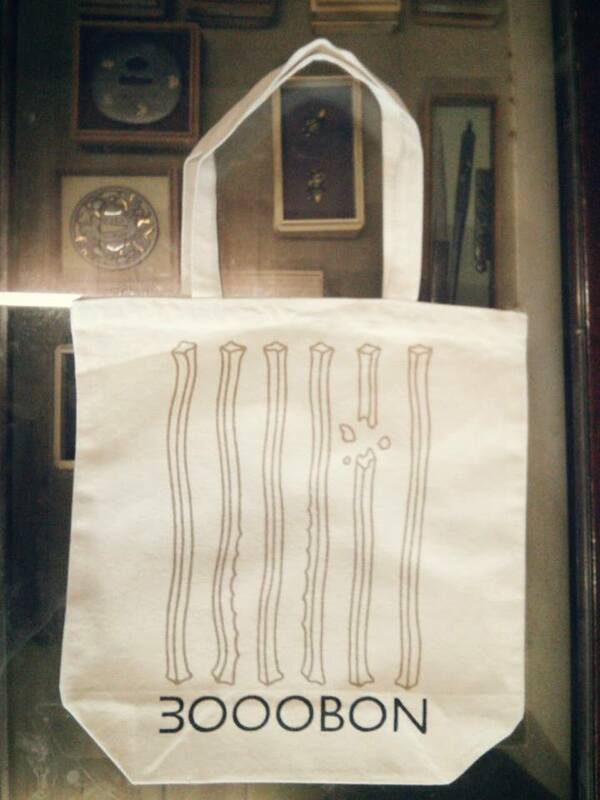 And we will pick out 2 lucky winners to receive a 3000Bon T-shirt or Tote bag. Leave a comment in the comments section. Clearly stating your first name or nickname. Please let us know what you think of our Blog and if you have any messages for aspiring, young Nihonga artists. While stocks last, we will try to accommodate your request for Tshirt sizing and apologise if we can’t. There is no cost on your end meaning we even deliver it to your postal address, wherever it is. The GIVEAWAY will open from 21 August 2013 – 31 August 2013. We will use a random generator to pick the lucky winners (with names and numbers assigned). 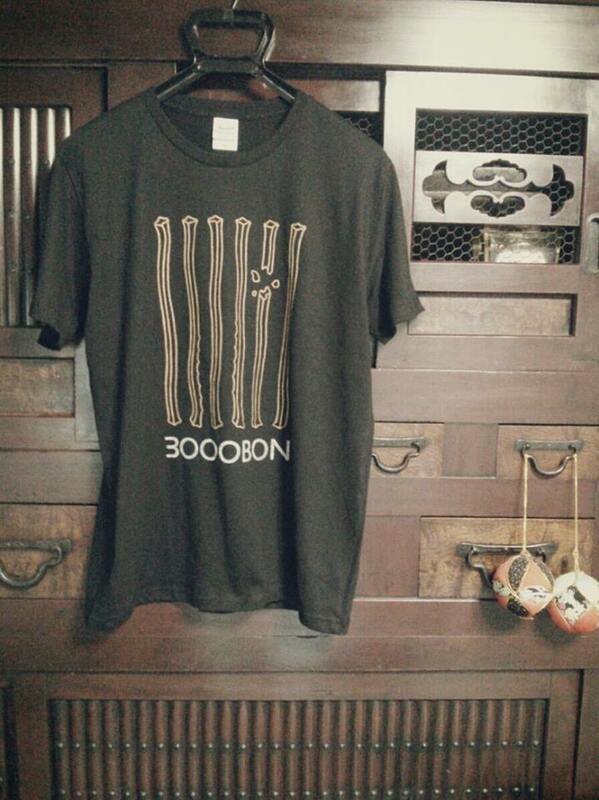 3000 Bon or Sanzen bon Nikawa, literally means 3000 sticks. Usually made of animal glue, it refers to a type of binding glue Nihonga artists use in their artwork to make the pigments adhere to the painted surface. The manufacturers were said to be ceasing the manufacturing of this and since the announcement, has sent some into a buying frenzy or campaigns to “save 3000 Bon”. There exists however, other alternatives to this glue. Innocent World is an exhibition of Japanese-style paintings by emerging artist, Tomoyuki Kambe　神戸智行. Japanese-style painting, otherwise known as Nihonga, originated in the late 19th century (Meiji period) and took inspiration from the rich heritage of traditional Japanese art. Considered a modern art movement, Nihonga evolved with the times reflecting contemporary issues and themes. 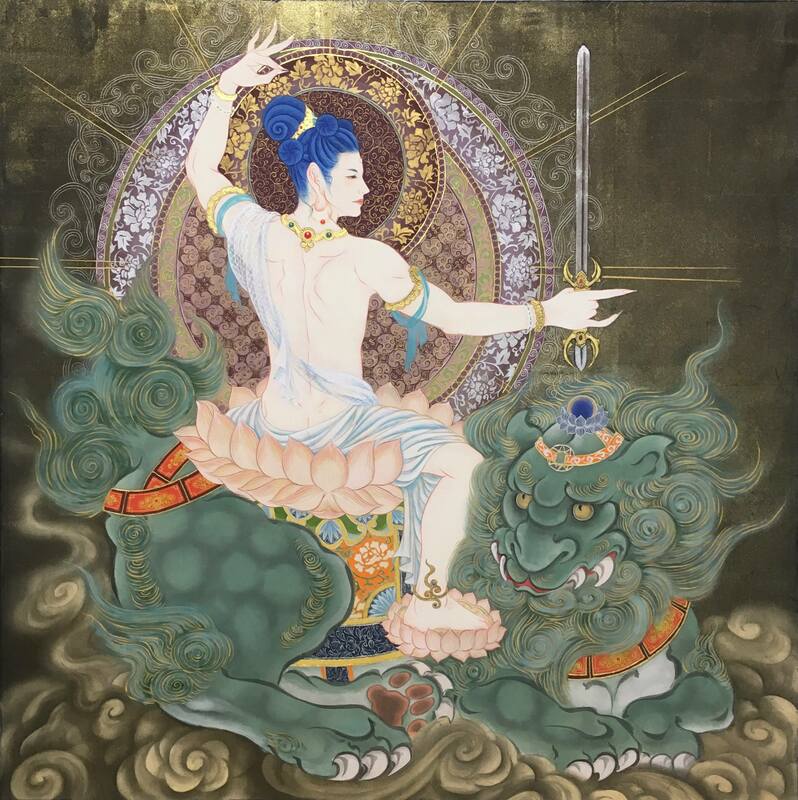 While some artists may continue to depict conventional Japanese themes and motifs, most contemporary artists explore a range of subjects relevant to their context. The single most identifiable characteristic of Nihonga is the medium. Artists who paint in the style of Nihonga use time-honoured materials and a select combination of mineral and synthetic pigments. Much training is spent understanding how pigments work, how to grind them precisely down to the exact milimetre to achieve the right hue and how to prepare them with nikawa (animal glue) so that the pigments adhere to the paper; all these not before priming the paper in layers. Then the artists have to understand the way of the brush and how to manipulate all of these to create a final work of art. Depending on the effect they want to achieve, gold and silver foil is also used for a decorative touch. 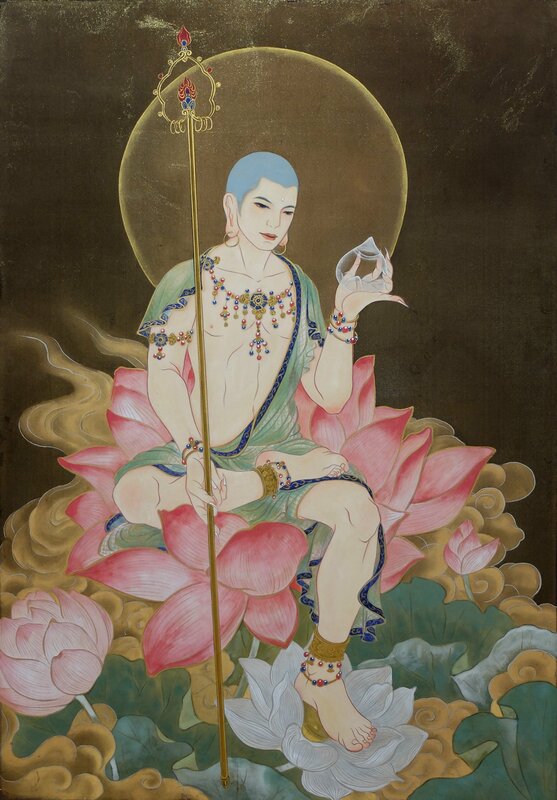 Nihonga paintings have a distinctive appearance- they refract light due to the sized particles found in the pigments. Just like how oil paintings carry that glossy sheen, the colours in Nihonga appear to shimmer ever-so subtly by bouncing light off the surfaces of the paintings. This delicate visual acuity has to be experienced in the flesh as photographs in catalogues can never reproduce such sensation. Another dynamic feature of Nihonga is how paintings change in appearance when seen in different light according to the times of the day. Kambe’s solo exhibition showcases around 15 works- all of which depict nature and the beautiful forms which can be found within. In some of the paintings, there are little things waiting to be discovered if you find time to do so. And as soon as you spot a lizard or a lady-bird hiding among the leaves, you start to notice the presence of others in the works and you want to look for more. The artist engages us in this act of looking and searching and brings us back, even if for a brief moment, to an innocent world where once as children, we indulged in the very same activity of discovering life in nature. Kambe acknowledges that everything coexists in relationships to one another, all coming together to give form and meaning in the world. While each living thing is uniquely original, it is the sum of these that make up the world. When he paints these small elements of nature, he illustrates their connections and brings to our attention the affinity of relationships in our societies. This is Kambe’s first solo exhibition outside of Japan and also Singapore’s first exhibition of Nihonga paintings. The exhibition also includes a small display of Nihonga raw materials which are largely unavailable in Singapore. The works in the exhibition include new paintings displayed in various formats as well as a series of screens from the collection of Dazaifu Tenmangu shrine in Fukuoka. Despite international audiences being no stranger to modern and contemporary Japanese art, Nihonga remains one of the least known artforms outside of Japan. 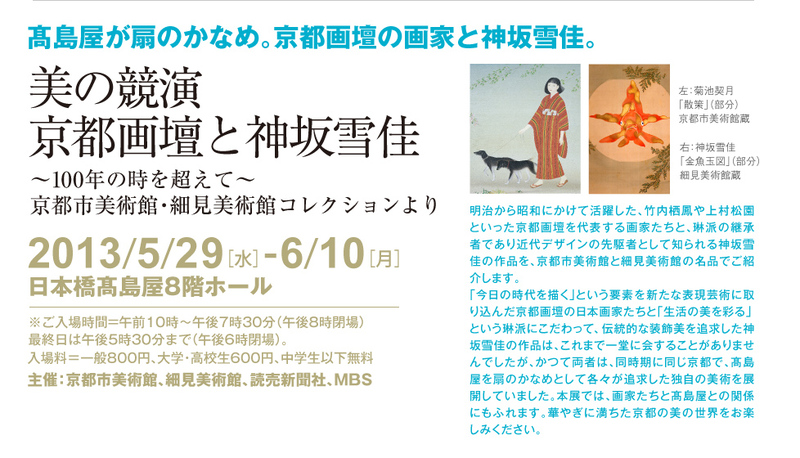 The exhibition and education initiatives by the Japan Creative Centre present a wonderful introduction to the beautiful world of Japanese-style paintings. Innocent World runs from July 20 – August 3o at the Japan Creative Centre. Born 1975, Gifu Prefecture, Japan. Graduated from Japanese painting (Nihonga) course at Tama Art University. Exhibited in China, Korea, the United States. Collected by the Sato Museum of Art and the Clark Center for Japanese Art and Culture. In the Meiji period, artists were presented with an alternative site to exhibit their work- the department store. Artists who were engaged by department stores now had access to additional exhibition opportunites and new ways to promote themselves. Working with these commercial ventures also introduced new dimensions to their practices as they experimented with both different formats and media for the production of commercial goods. This new way of engagement was a radical depature from the exclusive patronage relationships seen for instance, during the Edo period. The artists’ designs were now far-reaching to a wider and even international audience made possible by the department stores. Japanese textiles based on the collaborations of artists and textile designers were being showcased in international expositions. Other collaborations were evident in advertising, fashion and design. Focusing on the role of the department store as a cultural institution, Art + Living: Takashimaya. The Department Store as a Culture Setter presents works of art from the collection of the Takashimaya Historical Museum and explores the cultural history of this Japanese department store in such fields as design, architecture, advertisement, and fashion. 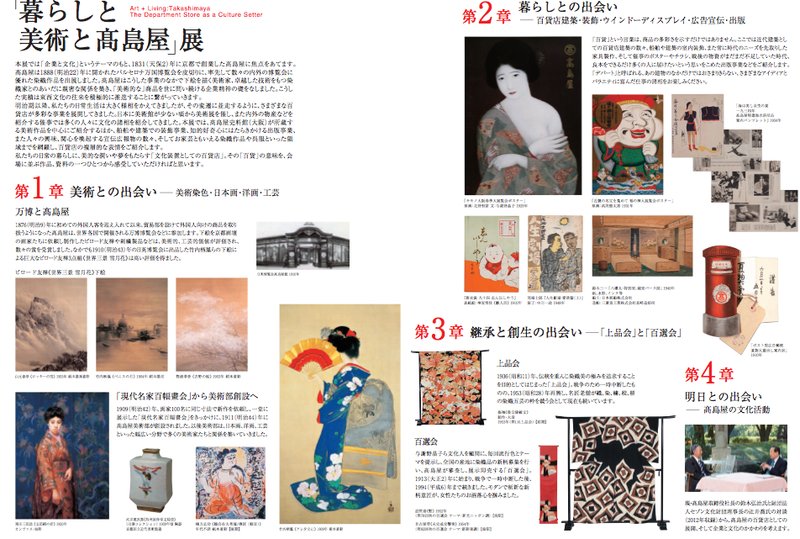 Of particular interest to us here will be the nihonga works on display both at the Setagaya museum and at select Takashimaya department stores as part of its Art Walking programme. Julia Sapin, “Merchandising Art and Identity in Meiji Japan: Kyoto Nihonga Artists’ Designs for Takashimaya Department Store, 1868 – 1912”. Journal of Design History, Vol. 17. No.4. The Design History Society: 2004, pp.317 – 336. Younjung Oh, “Art into Everyday Life: Department Store as Purveyors of Culture in Modern Japan”. Phd Thesis. University of Southern California: 2012. Ellen P.Conant, Challenging Past and Present: The Metamorphosi of Nineteenth-Century Japanese Art. University of Hawaii:2006.